Every year, Mike Milovick has to clear countless cans, bottles, and more left behind by thousands of rowdy, inconsiderate partygoers on Ezra Avenue from his ruined front lawn or face penalties from the city. 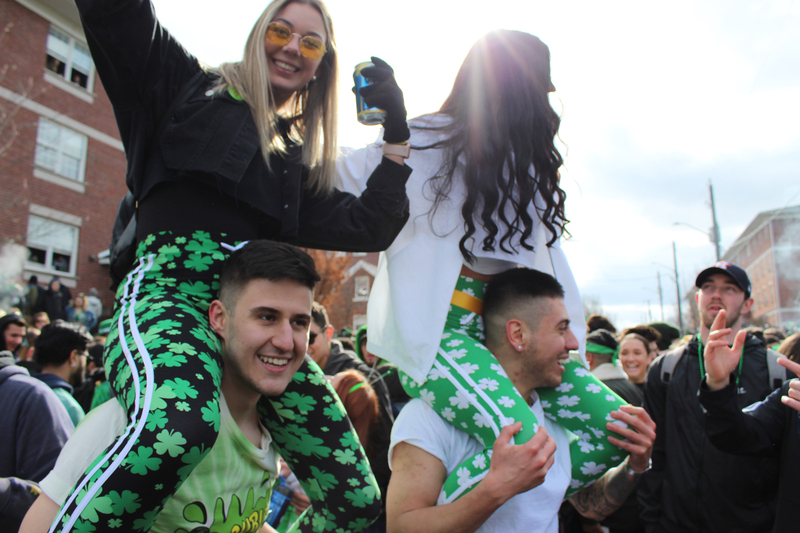 Nearly 30,000 people arrived from all over southern Ontario to join the unsanctioned party on Ezra Avenue on Mar. 17. The crowd was difficult to control and emergency services were close to overwhelmed. Cherri Greeno, spokesperson for the Waterloo Regional Police, disclosed that many partiers threw rocks, bottles, and other debris at police officers. In addition, one officer sustained a head injury and was taken to hospital, along with over 40 partiers. A person was charged for having open liquor in their car as early as 8:45 a.m. and, in another incident, a male was found in the trunk of a car. Greeno did not elaborate why he was there. Lukas and Lia Cerveira traveled from Milton to take part in the celebrations. They recognize that emergency services are lenient toward partygoers, and appreciate that some delays are possible due to the sheer number of people in the area. Lia stated that a sanctioned and paid event is not impossible, but would probably draw a much smaller crowd. “I think people would definitely pay for this. I think if it was a paid event, people would pay, maybe a few less people would come,” she said. Milovick, a property owner on Ezra Avenue, also recognized the problem posed to emergency services by the crowd and stated that ambulance delays and unavailability may result in fatalities. He stated that the region needs to be more active in trying to stop unsanctioned street parties. “I think that the city and the region need to take a bigger role in addressing the situation. Obviously, over the years, it’s just getting bigger and bigger, and I’ve always felt that someone’s going to be seriously hurt or there may to be a fatality because of this event,” he said. “The Waterloo Region is part of a task force that is attempting to understand and minimize street parties. Their main concern is the safety of the residents and the partygoers,” Greeno stated. Waterloo Regional Police estimate more than 22,000 students attended. There were 41 calls for service and 18 people were transported to hospital. Down from 52 hospitalizations and 619 charges laid by police last year.